Flu, or influenza, is a common infectious viral illness spread by coughs and sneezes. It can be very unpleasant, but you'll usually begin to feel better within about a week. Information for the public has been produced and includes some leaflets. This information can be found on the NHS inform website. A range of materials for healthcare professionals have also been produced and can be found on the NHS Education Scotland (NES) website. Listed below are key documents and resources that have been made available to assist with Seasonal Influenza vaccination programme. Guidance is available from Public Health England (PHE) on the use of antiviral agents for the treatment and prophylaxis of seasonal influenza. The Scottish Microbiology and Virology Network (SMVN) and the Scottish Health Protection Network (SHPN) have produced a joint advisory statement that describes key recommendations that will ensure a better access to diagnostic data for future seasons. In season 2018 to 2019, four different types of flu vaccine will be offered to the adult and the at‐risk groups as part of the influenza vaccination programme. The recommended vaccine for individuals will depend on the evidence provided by Joint Committee for Vaccination and Immunisation (JCVI) relating to the effectiveness of vaccines for different age groups and available vaccine supplies. This will benefit patients by ensuring that they have the most suitable vaccine that gives them the best protection against flu. The flu vaccine is the best available protection against the flu virus. Adjuvanted trivalent flu vaccine (aTIV) will be offered to all adults aged 75 years or more. Trivalent inactivated vaccine (TIV) will continue be offered to all adults aged 65 to 74 years. Quadrivalent inactivated vaccine (QIV) will be offered to children aged from 6 months to 2 years, and in adults from 18 years to less than 65 years of age who are at increased risk from flu because of a long term health condition. Live attenuated influenza vaccine (LAIV) will be offered to adolescents under 18 years who are at increased risk from flu because of a long term health condition. 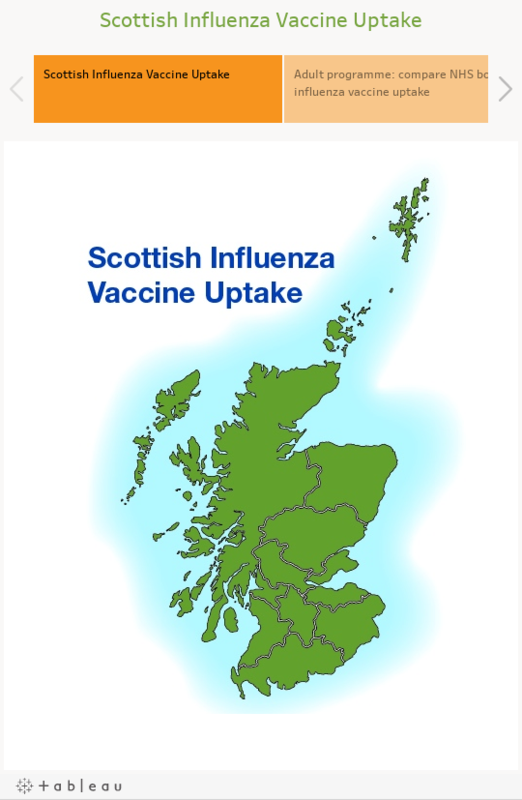 Use the dashboard to explore the seasonal influenza vaccine uptake data in Scotland. The data and the methodologies used in the national seasonal respiratory report can be viewed in the caveats and supporting notes. View the reporting rates of influenza-like illness (ILI) consultations from General Practitioners in Scotland technical document. Due to the 2017 to 2018 data issues described in our 2018 to 2019 ILI technical document, the ILI data included on the weekly reports has been revised. View the retrospective 2017 to 2018 data.